Thursday, Friday, Saturday 8 p.m.; Sunday, 2 p.m. In the late 1920s, 10 complete strangers (or are they?) find themselves on a secluded island, trapped inside an abandoned mansion, aptly called Raven’s Head. One by one they fall victim to an evil killer and it’s up to a pair of sleuths to find the murderer, before he/she finds them. Then they are summoned to a mysterious midnight reading of the Will…very spooky. 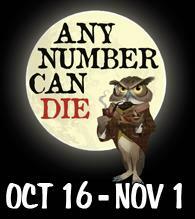 Any Number Can Die is a hilarious spoof of the Agatha Christie-style mysteries, complete with all manner of engaging “suspects.” Does the heiress know about the Mansion’s hidden doors? Maybe the Butler did it? Or will the unassuming spinster, Ernestine Wintergreen pull a ‘Miss Marple’, and find the killer? This grand farce is rollicking fun, and a perfect venue for the whole family. We are entering the height of the cultural season now, so a sell-out is likely. This entry was posted in Area Events, Arts, Culture, Schools & Clubs and tagged Any Number Can Die, Fountain Hills Theater. Bookmark the permalink.